2016 - 2017 Twelfth Annual National Youth Arts Awards! National Youth Arts is excited to begin announcing the winners of our 12th Annual National Youth Arts Awards to honor outstanding work by youth in the arts. This year more than 550 productions were considered for the awards, including shows from more 200 different members spanning 16 states. For information on how to get involved, please click here. This year's award winners were selected from nominations by a panel of more than 50 judges and reviewers. 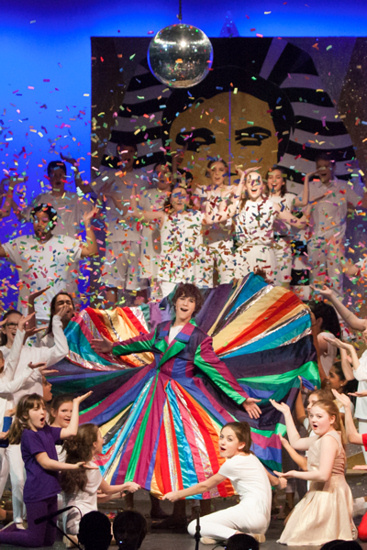 In addition to the youth who performed in schools and youth arts companies, anyone age 18 and under who performed at a show reviewed by a judge was also considered for the NYA awards, as well as the adults who participated in the youth productions backstage (directors, set designers, costume designers, etc.) and guest adult performers in productions designed for youth. College artists are eligible for our University Arts (UniArts) Awards presented in conjunction with the National Youth Arts Awards. A few award-winning alumni include Tony Nominee Emily Skeggs  (Broadway: Medium Alison in Fun Home, TV: Young Roma in When We Rise), Asher Angel [2013, '14, '15] (TV: Jonah Beck in Andi Mack), Brian Crum  (TV: America's Got Talent finalist), Veronica Dunne [2011, '12, '13] (Broadway: Roxie in Chicago, TV: Marisa Clark in K.C. Undercover), Emma Howard [2011, '16] (Broadway: Hortensia in Matilda, Film: The Beguiled), Brennyn Lark  (Broadway: Eponine in Les Mis), Ashley Park  (Broadway: Tuptim in The King and I), and multiple-Grammy Nominee Ariana Grande . The award winners will be formally presented with their awards on stage and nomination certificates will be available at the registration table for the nominees. The ceremonies honoring all of their accomplishments are held in different regions of the country including multiple ceremonies in Arizona, California, Colorado, Virginia, and New York. If award winners can't make it to their ceremony, they might be able to attend one of the other ceremonies. Thank you all for your incredible work and all the unforgettable entertainment over the past year, and we hope you can join us! Ceremony Portfolio for Agents: Award recipients and nominees are eligible for talent agency submissions. If you're interested in having NY and LA agents review your headshot/resume, please email them to rob@nationalyouththeatre.com. If any of the agencies are interested, you'll be contacted directly via the email on your resume. Reminder: Your resume should only have the email and cell of someone age 18 or over (your parent or guardian if under 18). Registration begins @ 6:45 p.m. Awards Presentation begins @ 7:30 p.m.